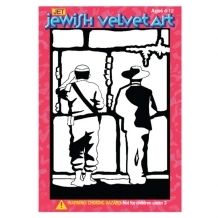 Design your own unique velvet art creation by carefully coloring the non velvet spaces using the six colored marker pens included! Measures 6" x 9". Ages 4 through 12. .. 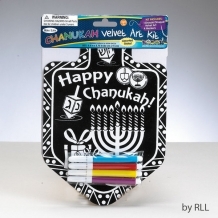 This unique Chanukah velvet art includes a dreidel shaped board and four bright colored markers. 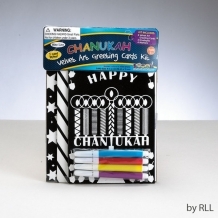 Just color in the white area on the board to create a beautiful Chanukah decoration! 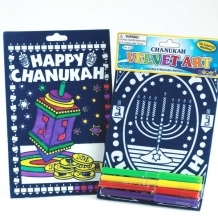 Great for child..
Children will love creating these unique and beautiful Chanukah greeting cards simply by using the enclosed markers to color in the non-velvet areas. 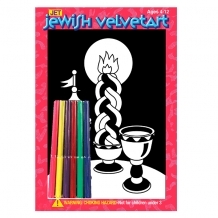 Kit comes complete with 3 assorted Chanukah gre..
Color your own beautiful Dreidel velvet art simply by using the enclosed markers to color in the non-velvet area! Inclues 1 velvet art board measuring 8.75" x 5.75" and 4 markers. 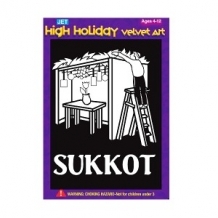 Age..
Color your own beautiful Menorah velvet art simply by using the enclosed markers to color in the non-velvet area! Inclues 1 velvet art board measuring 8.75" x 5.75" and 4 markers.&nb..
Design your own unique velvet art creation by carefully coloring the non velvet spaces using the six colored marker pens included! Each board measures 6" x 9". Ages 4 through 12. ..